Singapore is a gem. It’s super safe, easy to get around, cheap flights in and out every day, and the food is some of the best in the world (seriously, I spent 80% of my time eating). I’d say this is one of the best countries to visit as a family – endless activities, no need to worry about scams or traveller’s diarrhea, and most tourist attractions are kid friendly too. 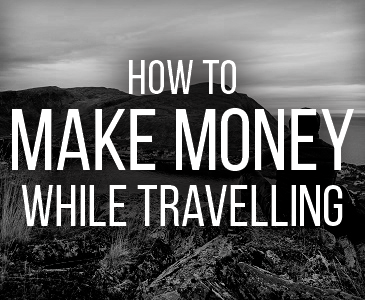 But even as a solo backpacker or a few friends looking for a party, I believe you’ll find it hugely fulfilling too. The question is, where to stay in Singapore? As small as the country is, it’s divided into some pretty unique neighbourhoods, all with their own quirks and attractions. Don’t worry though, I’ve got you covered. Singapore is incredibly small and easy to navigate around, and their public transport system is a dream compared to many Asian cities. This means the question of where to stay in Singapore is not a huuuge decision, as you can visit all other areas of the country pretty easily anyway. However, it’s always nice to have things you like on your doorstep, and especially in the Singapore heat there will be days you don’t want to venture too far anyway. Below I’ve broken down the eight main areas in Singapore that are top choices for visitors. 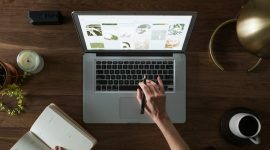 I’ll give you a brief run-down on what to expect from each, plus some accommodation options to suit every style and budget. I’ve suggested a few different accommodation options for each of these main areas, with something to suit every budget. Let’s kick this off with one of Singapore’s most famous areas – Marina Bay. You’ll probably be familiar with the Marina Bay Sands hotel, which is even more stunning in real life. Don’t worry, there are a lot of cheaper, more basic places to stay! This area of town is super fancy, packed with luxe hotels and shiny floors. It’s popular among tourists for several reasons, the main one being The Gardens by The Bay. For anyone unfamiliar, this is a little wonderland of tropical plants, towering structures and an amazing atmosphere. This haven is a complete contrast to the strips of skyscrapers and expensive bars and restaurants that line the water. If you like your cities buzzing with the finer things in life, this is the area for you. Couples will enjoy the expansive dining options and the sight-seeing that there is to do here. There are lots of shopping opportunities here, as well as great nightlife and fantastic food. Some of Marina Bay is a world away from other Asian cities, like hectic Bangkok, and it can take some time to adjust. If you look closely, however, you’ll find little local food places tucked down side-streets, and canteens packed with locals enjoying ‘Kaya Toast’ – delicious coconut butter sandwiched between bread and topped with pandan or eggs. Where to stay in Marina Bay? Pan Pacific Singapore is the ideal spot for anyone after a slice of luxury! 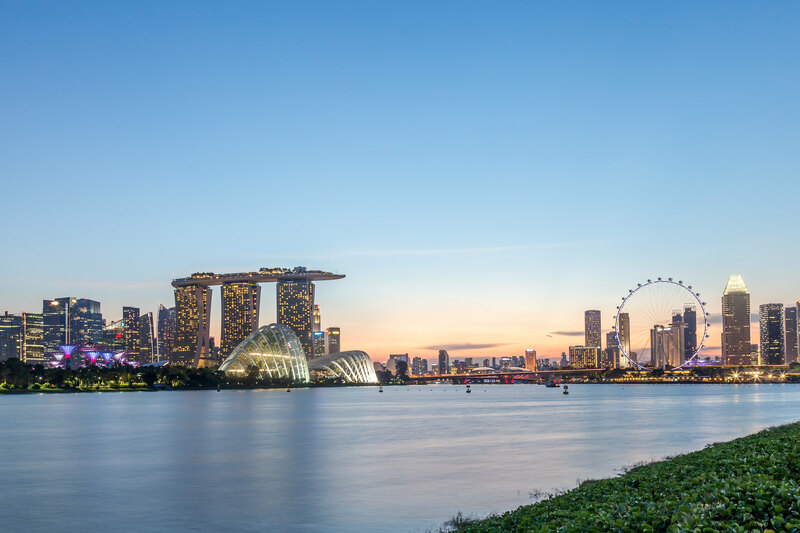 This hotel is perfectly located in the centre of Marina Bay, meaning that you’re a stone’s throw from the main attractions, restaurants and bars. The rooms here are designed with comfort in mind, but are also very sleek. Relax by the outdoor pool and wind down in style. Get the best rate here. For the backpackers and budget travellers – there aren’t many cheap options available in this area! If you’re on a budget, try staying just outside Marina Bay in nearby Orchard Road, or maybe the CBD. The ideal location for anyone who enjoys shopping, Orchard Road is home to a variety of accommodation options. Picture a long street, stretched out with malls, cafes and a whole lot of tourists. I loved this area for its friendliness and familiarity! Arriving in a new place can be overwhelming and, although you want to embrace the local culture, you sometimes need to camp out in a Starbucks for an hour. 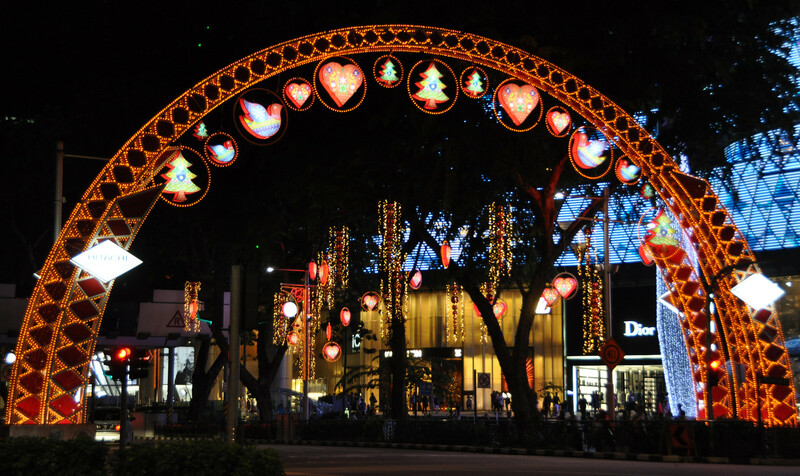 Orchard Road is packed with local boutiques, international chains and fine dining spots. This area of Singapore is bigger than it looks, so wear comfy shoes and spend the day hunting down bargains. It’s very easy to reach from most other areas of Singapore, so you can still take a day-trip here if you choose to stay elsewhere. There are small patches of greenery along this strip of retail heaven if you need a break. If you’re travelling as a family, this is an ideal spot! There’s plenty of child-friendly entertainment, huge air-conditioned malls if you need a breather from the heat and all the comforts of home if you’re struggling. This area isn’t really angled towards solo travellers as the main activity is shopping, but it’s still a fun place to enjoy. Where to stay in Orchard Road? Footprints Hostel is a short (15min) walk away from Orchard Road, and is super cheap for what it offers. Grab a bed for the night and enjoy great service, fast WiFi and nearby transport stations. They have a range of dorms available, so you can ease yourself in with a small one if you’re new to the hostel-world. This is a great place to meet people, with lots of food spots to bond with new friends at. Best rates here. Lloyd’s Inn is the perfect place for anyone wishing to explore Orchard Road. Its location is ideal, and the inn itself is very stylish. It feels more like a quirky Aribnb than a budget hotel. Forget grungy dorms and cluttered rooms – this place is all about minimalism! The space is nice and quiet, so is better suited to couples or friends travelling together. If you like clean lines, a European-vibe and calm garden areas, head here. Best rates here. If you fancy splashing out and treating yourself to something world-class, book yourself into Goodwood Park Hotel. The pool is huge, making it the perfect place to come back to after a day of shopping! 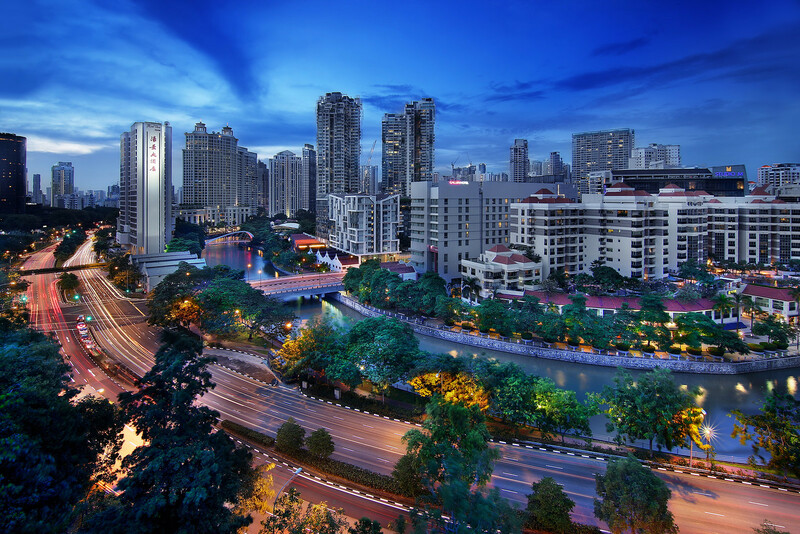 Goodwood is located near to Orchard Road without being in the busy, noisy nearby area. You get the best of both worlds with this luxe gem. Best rates here. Clarke Quay is one of the best places to visit if you’re after something a bit lively. 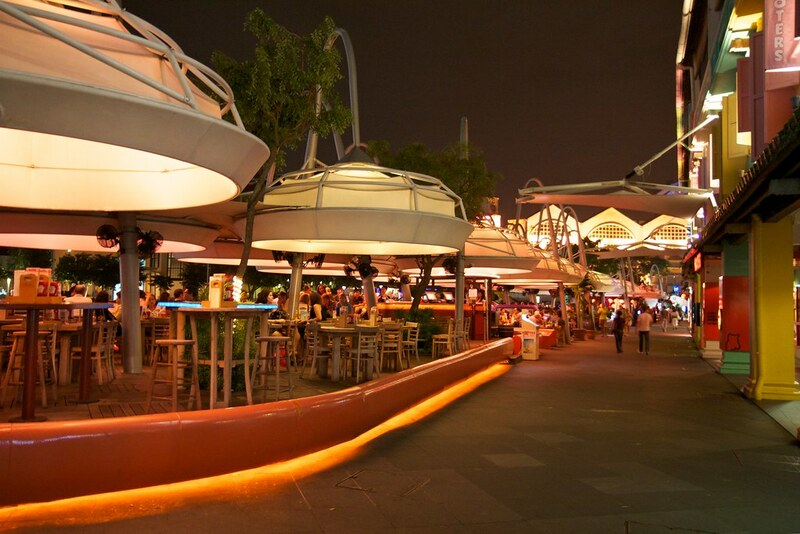 This is Singapore’s hub of nightlife, late-night dining and great music. The docks here are packed with mismatched buildings that have been redeveloped as trendy bars and clubs. The architecture itself is beautiful, and you can easily spend a whole day just wandering around the Riverside area. There are some beautiful, quiet areas if you want to get away from the thrum of the city. Make your way up to the nearby For Canning Park and take in the incredible views. Spend the evenings immersing yourself in its nightlife and fun atmosphere. If you fancy a night out, work your way around quirky old buildings, bar-hopping and making the most of the buzz. This tends to be a pretty touristy area, but that’s definitely not a bad thing! Solo travellers are pretty much guaranteed a good stay here, as there are plenty of places to meet new people. Where to stay in Clarke Quay? River City Inn is great for any travellers who want a dorm room without having to lower their standards. The rooms come in a variety of sizes, and are all nicely decorated and homely. If you’re planning to stay around the Clarke Quay area, this hostel is in the perfect location for you! Best rates here. Champion Hotel City is a great choice for anyone travelling through Singapore on a budget. This hotel is just the right level of chic without breaking the bank. If you fancy being close to Clarke Quay, book a stay here and relax into a blend of relaxation and excitement. Quirky decor and a rooftop views await you! Best rates here. Make your stay in Clarke Quay memorable by checking in to the Park Regis Singapore. This hotel offers the ultimate in comfort and luxury, and is an ideal location for those wanting to explore nearby Riverside. Bag yourself a spacious room with amazing views, a huge swimming pool and impeccable customer service. Best rates here. 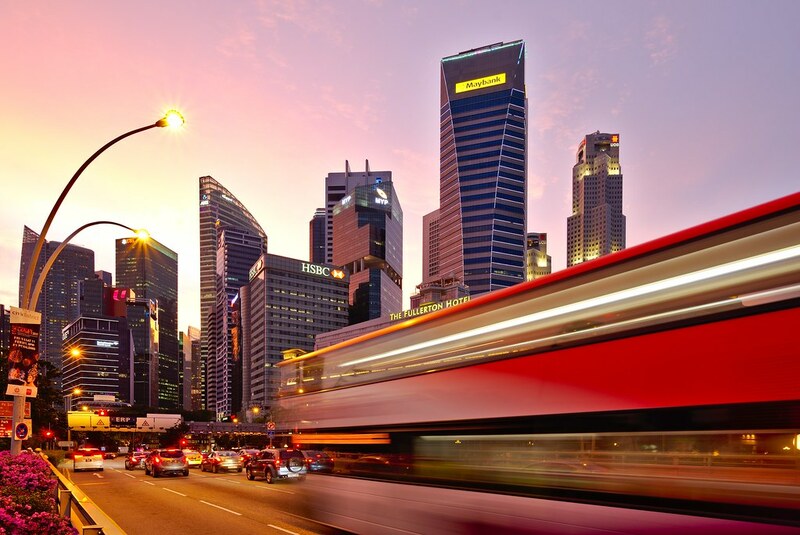 The Central Business District (CBD) is one of the cooler places to stay in Singapore, and is packed with expats and 20-somethings living abroad. While ‘the CBD’ technically covers many areas of Singapore, it’s mainly used to refer to the central zone just south of the river. It is often referred to simply as ‘The City’, due to the buzz of business and activity going on here. There are some little parts of this region that are total contradictions of themselves – tiny, colonial-era buildings squeezed next to huge, shimmering towers of commerce. You’ll be walking between mirrored shards of banks and businesses when a temple will randomly pop up. I love Singapore for its order, as well as its ability to surprise. The CBD is great for couples and group travellers, but it can be a little tricky to meet new people if you’re travelling alone. Those travelling with young children may feel a little out of place in the business-zone of Singapore, despite being very much welcome. Foodies will love the huge outdoor canteens and cheap food options! Where to stay in Singapore CBD? 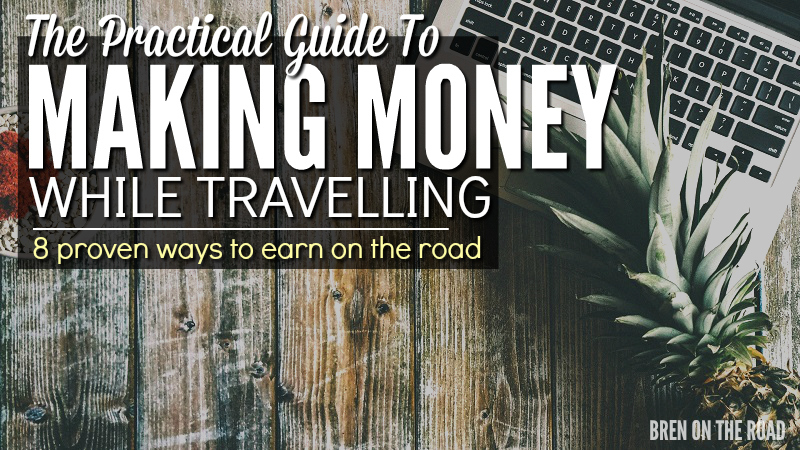 Travelling through Singapore as a backpacker needn’t cost the earth! Heritage Hostel is slightly closer to Chinatown, but is still in a great location for anyone wanting to visit the CBD. You’re close some amazing foodie havens, and the hostel itself is a lovely place to hang out. Stay here as a solo traveller and find plenty of new friends. Best rates here. COO Boutique Hostel is within walking distance of the CBD area in Singapore, and offers everything a traveller could dream of. Clean rooms, friendly staff and great WiFi! This is a great place for anyone new to the world of hostels, as the rooms are all welcoming and spacious. Best rates here. This hotel is located between Marina Bay and the CBD, making it a great spot for those who want to cram in lots of sight-seeing. The Fullerton Hotel offers the best of the best. Imagine stunning views across The City, a ginormous pool to relax in alongside the hub of sky-rises and, incredibly, an indoor pool surrounding the lobby steps – with Koi Carp in it. See what I mean?! The best of the best. Best rates here. As with most countries, Chinatown is one of the cheaper and quirkier places to stay. It’s within a short distance from other touristy areas (although, everything in Singapore is!) 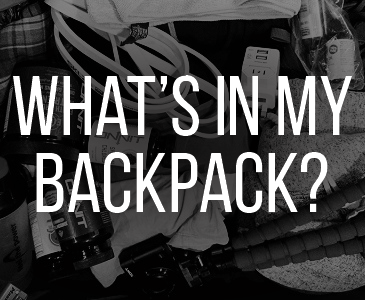 and is packed full of things to do. I loved this area for its eclectic mix of architecture – it’s both old and new; traditional and modern. There are lots of temples here that you can visit, often cornering streets of colourful-but-weathered buildings and newer coffee shops. Temple Street is the main section of Chinatown, and is lined with beautiful architecture and historic sites merged with modern attractions. Kitschy cafes make the perfect people-watching spots. This is a fantastic area to visit and stay if you have small children – there is always something new to distract yourself with, and simply walking around becomes a fun activity in itself. If you’re travelling alone, take your time exploring the various sites of worship, from Buddhist temples to mosques. Beds and Dreams Inn is the perfect choice for anyone who wants to meet people without splashing the cash. 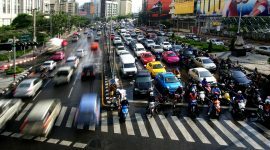 It’s near to public transport links, meaning you can easily zip your way around if you’re on a bit of a tight schedule. The dorms are roomy and light, and there’s great WiFi connection throughout the hostel. This is a great accommodation choice for solo travellers. Best rates here. If you’re travelling on a budget but still enjoy the finer things in life, head to Adler Singapore. Located in Chinatown, this is a striking co-living space with amazing views across Singapore. You’re in the perfect place to explore Chinatown, and not far from Singapore’s other touristy gems. Living on a budget doesn’t mean that you have to miss out, and the Adler is the perfect combination of cheap and cheerful. Best rates here. If you want experience Chinatown’s lovable mayhem while having a fancy bed to fall into, book a room at Amara Singapore. This hotel offers the ultimate in luxury, with decadent interiors and a wonderful pool area. Everything from the restaurant to the sports facilities is luxurious – who knew working out could feel so classy? Best rates here. Little India is normally one of the first places I head to in a new city. The food, for one, is incredible. But I also love the general vibe of colour and fun and celebration that these areas bring. 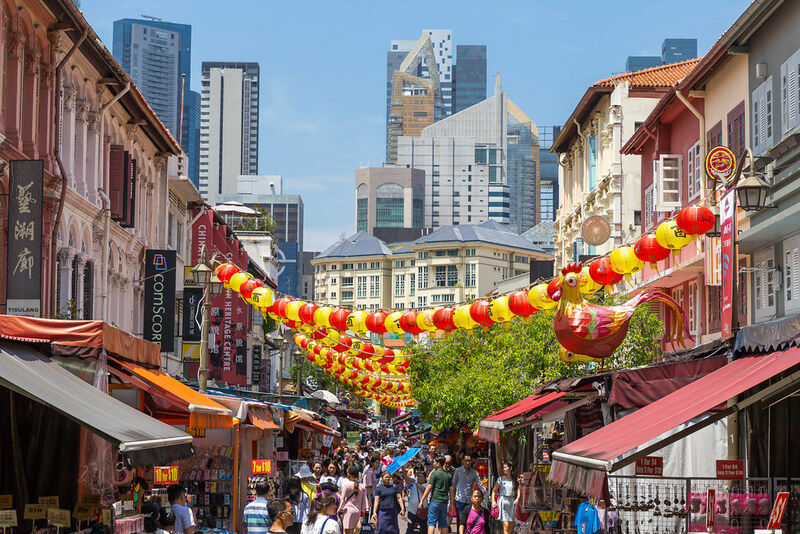 Singapore’s Little India is no different – streets lined with vibrant buildings, steam clouds scented with all the spices you can imagine and constant smiles. This is the perfect area to stay for any type of traveller. Solo adventurers will find friendliness on every corner; children will be entertained by the endless lights and lanterns. This area of Singapore can feel a little bit touristy, but the food is delicious and authentic. Spend your days here wandering around street markets, ducking in and out of temples and indulging in chai tea. 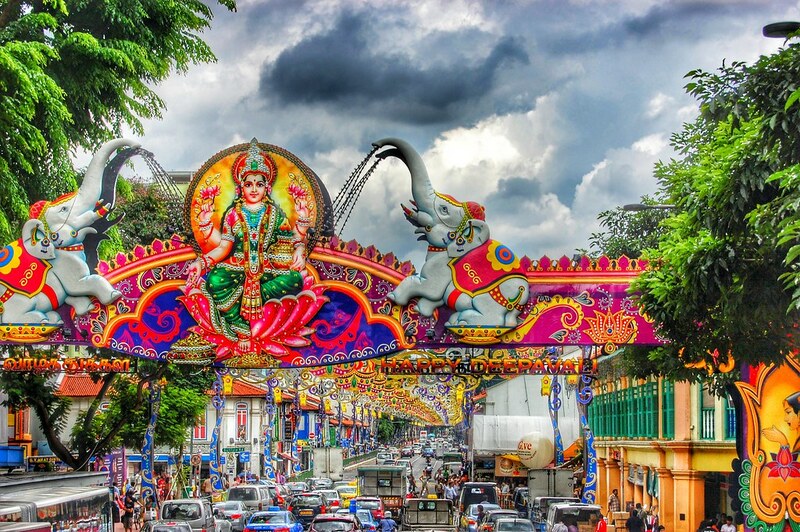 Little India is a fun and friendly place to visit, and The InnCrowd offers just that in their hostel. The beds are super comfy, you’re in an amazing location and the price is very reasonable! There are lockers to ensure security, and a nice chill-out area to meet other travellers. The bathrooms are also very swanky, which always makes a difference. Best rates here. Adamson Lodge is ideal for anyone who’s travelling on a budget but still enjoys the finer things in life. There are a range of dorm sizes, so you can choose just how sociable you’re feeling. 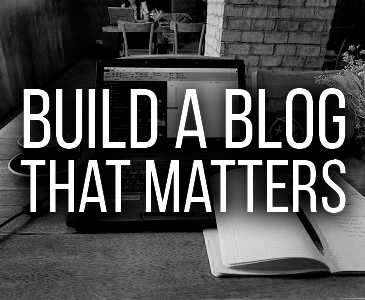 There’s plenty to do nearby, so you’ll probably find yourself out and about most of the time anyway. This lodge is right opposite one of the main MRT (metro!) stations, meaning you can explore all of Singapore easily. Best rates here. Little India is full of cheap food and quirky souvenir stalls, but there’s a slice of luxury to this area, too. One Farrer Hotel and Spa is right in the mix, but is a world away from the busy streets and lovable mayhem of Little India. If you like huge pools, in-house spa treatments and marble floors, this is the place for you. Every little detail has been carefully thought through, making this a beautiful place to escape and relax, while still immersing yourself in all that Singapore has to offer. Best rates here. This little island is nestled just off the southern tip of Singapore. While Singapore isn’t usually viewed as a beach getaway, this island is perfect for lazy days. Hop across from mainland on a boat, or take the cable car over and enjoy the amazing views. This island is the perfect place for anyone seeking a bit more fun! Spend your days here at the Butterfly and Insect Kingdom, SEA Aquarium and Universal Studios Singapore. There’s a small entrance fee to the island, so go for a long weekend and make the most of it. Where to stay on Sentosa Island? Sofitel Singapore Sentosa Resort is the best place for anyone looking to live in luxury on this Singaporean island. Opt for your own private pool for those days when you can’t quite be bothered to walk to the nearby beach. This 5-star resort offers the best of everything, so get ready for a whole lot of pampering at their in-house spa. Best rates here. Budget travellers: Sentosa isn’t a great option for those on a budget. Try stay in one of the other areas and make Sentosa a day trip. 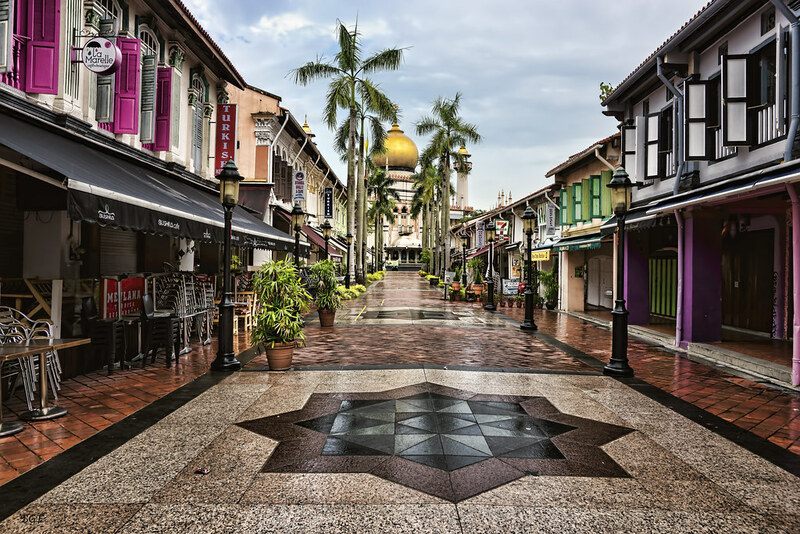 Another lovely gem in Singapore’s rich cultural tapestry, the Muslim quarter is a great place to visit. Packed with local charm and quirky buildings, the Arab Quarter is the place to visit for great food. Any European’s will be overwhelmed by the choice of cafes and hipster brunch spots – cafe culture here is way bigger than many areas of Asia. Get some clothes tailor-made and explore the fabric stalls. This is a wonderful place for anyone into textiles and art! It’s full of boutiques and corner shops crammed with hidden treasures. Head here as a solo traveller and immerse yourself in the vibrant culture, taking in the sights, smells and beautiful sounds from local mosques. If you’re wondering where to stay in Singapore for a bit of hipster love, this is the spot. This is a fantastic place to take small children, or travel alone. Hostels are available, but there are also world-class hotel resorts for those who enjoy the finer things in life. It’s also known as Bugis neighbourhood and has great transport links to other areas of Singapore. Where to stay in the Arab Quarter? Backpackers who are tight on money should book a stay at Five Stones Hostel. With 23 rooms available, you’re sure to meet plenty of other travellers. You’ll be in a great location to explore, with lots of nice cafes and restaurants nearby. The decor is bright and cheerful, which makes a nice change from gloomy dorms! Best rates here. Stay at the Cube Boutique Capsule Hotel. If you haven’t stayed in a capsule hotel before, this is the perfect place to start. The beds here are impeccable, very private, excellent beds and the price is a steal. Personally I love sleeping in capsules, it’s always comfortable and very minimalist – puts you right in the travel mood. Plus they’re cheap! Best rates here. Take a break in Andaz Singapore and put your feet up in style. This hotel is everything you’d expect from a top end 5 star hotel – spotless, sleek and classy. With a great on-site restaurant and nearby eateries to enjoy, you’ll be spoilt for choice. The rooms are BIG and light, giving you an amazing view of all that Singapore has to offer. Not to mention the huge pool, state-of-the-art fitness centre and just a few minutes from the buzz of the Arab Quarter. You won’t be disappointed. Best rates here.